Tired of Tipping Ducks at Your Duck Pond Carnival Game? WE ARE TOO! We cannot tell you how many carnivals and fall festivals we have visited to find a sad looking duck pond with duck tipped over just as you see above! Continue reading to learn about TWO fast & incredibly easy solutions from the Carnival Savers blog! Hint: one of them doesn't involve ducks at all! Carnival ducks come in many varieties, but there are two basic categories. #2 Colorful hard plastic ducks designed for the Duck Pond Game that do NOT tip over easily - but one is better than the other - so please keep reading! We have found even when ducks are labeled as "weighted" ducks, and designed for a duck race or game still often tip over. Why? From what we deduce, the seams allow water into the cavity of the ducks, and the water tends to make the ducks tip on their sides. 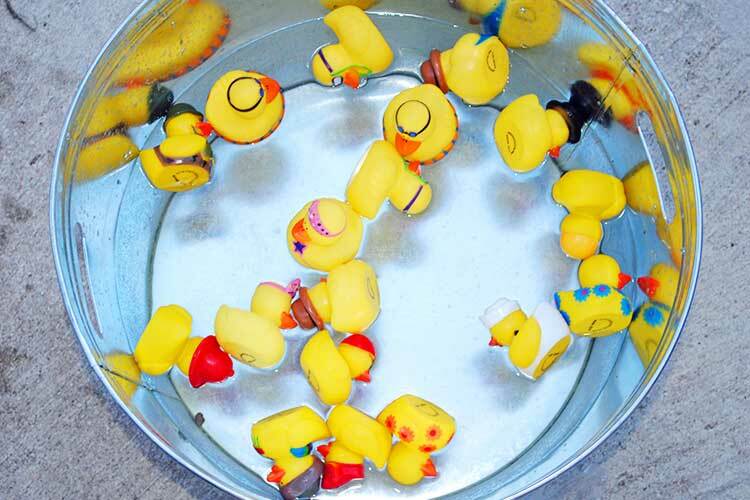 So,these ducks start out rightside up and ready for the game, but as the minutes turn into hours, they start to take on water and then tip over which is frustrating to any carnival planner! Here's our BIG TIP: we've found that our Matching Ducks (yellow duck shown below) and Neon Mini Ducks (colorful smaller rubber ducks shown below) do NOT tip over (easily.) We also found Mini Neon Ducks do great with staying upright and could be used for a duck game as well! There are two main ways to play the Duck Pond carnival game. You can play the traditional Duck Pond Carnival Game (full set-up and instructions here) or our Matching Ducks Carnival Game game (here). The Duck Pond game is adorable and very simple! In short, fill a small inflatable pool with water and have at least 20 rubber ducks. 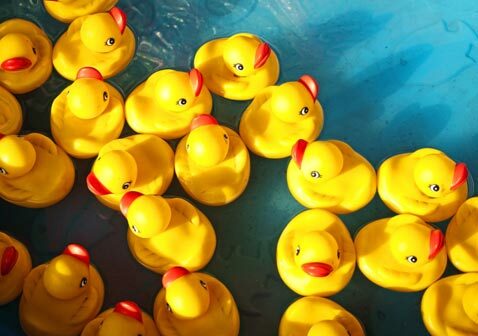 The traditional version has volunteers mark the bottom of each duck with "1," "2," or "3" and these numbers correspond with the type of prize children will receive. The Matching Duck game is similar, but instead of marking ducks with numbers, children select two ducks (numbered 1 through 10) and if the two ducks match, they win! We generally give kids 3 chances to find a match and this makes the game much more exciting! We recommend the Matching Duck Game because kids seem to enjoy the challenge and for the little ones - it a matching skill they are learning with a fun game - so a little bonus too! These adorable rubber themed duckies look great in the package, but the moment you put them in the water some float on thier sides from the start! 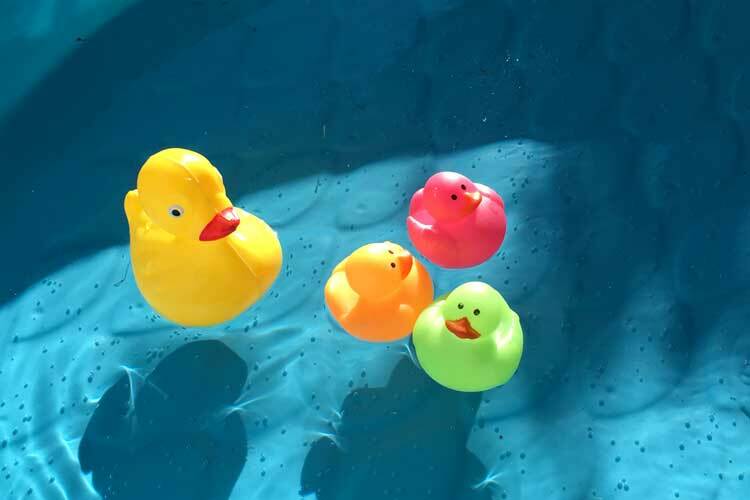 While these ducks WON'T float well, if you are having a holiday- or season- themed carnival, consider using fun themed ducks as a prize for another game or booth! Kids do love to collect the different themed ducks if just for decoration! Below, we've added some links to help you out with a starting point for your rubber ducky shopping experience. Here are ducks perfect for spring and Easter. These rubber ducks are perfect for fall and Halloween. These are ducks perfect for winter and Christmas. We've found, after more than a decade of helping with carnivals, that our floating sailboats do not tip over easily. 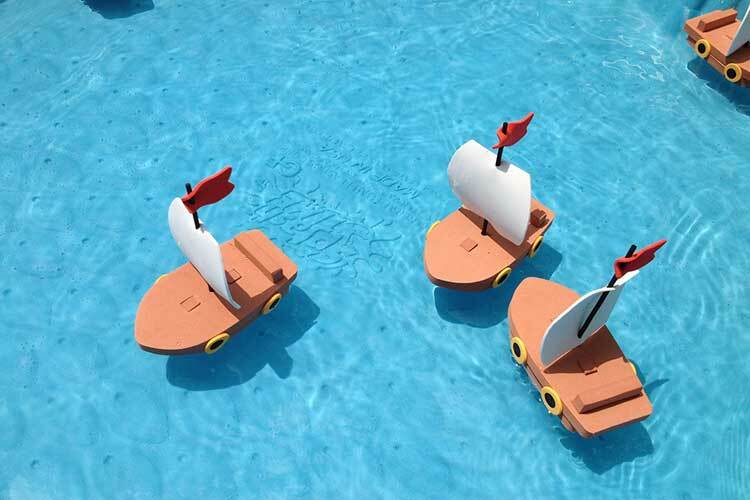 Floating sailboats are an incredibly adorable duck pond alternative for anytime but especially for a summer event! Floating frogs on a Lily Pad are also excellent choices for a cute spring carnival, and do not easily tip over either. Both the frogs and sailboats are easy, no-glue-required crafts that will take only a few minutes to set up. If you're limited on time, then of course our Matching Ducks don't require assembly and also don't tip over. Again, we suggest not using any other rubber ducks but our Matching Ducks if you want a duck pond without tipped-over or upside-down duckies. Thank you for reading the Carnival Savers blog! We have even more articles that will help you save time and money at your next carnival. Click here to see them!